Recognize these bright stripes? They're on socks, which I started back in June, and have no business being worked on so close to Christmas. It was incredibly relaxing just to give myself a day to do nothing but finish things off and watch other people's stories unfolding. Relaxing yet productive, because I not only finished these two pairs of socks but also a third pair and the latest ManCowl. I'm close to finishing writing up the pattern for it and if I can put together photographs too I'll have that ready for you this week. Probably you wouldn't knit a last-minute ManCowl at this point, but it'll be good to have the pattern done as well as the actual cowl. Meanwhile, I'm just so happy about these colours! 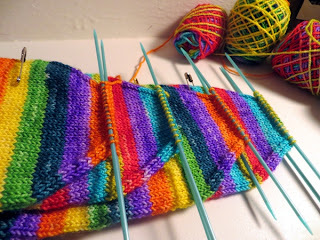 I might have to use the remains to knit a pair of ankle socks that combine all of these stripes in one amazing place. They are that bright and cheerful, which is ironic considering what a grey, muted, quiet day it was. Two opposite kinds of bliss all at once. 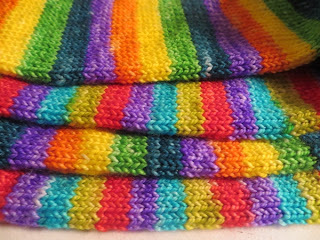 Hope you had a wonderful weekend too and I will see you tomorrow, with more pretty pictures of knitting. Till then, take care and I hope you get to do some making! 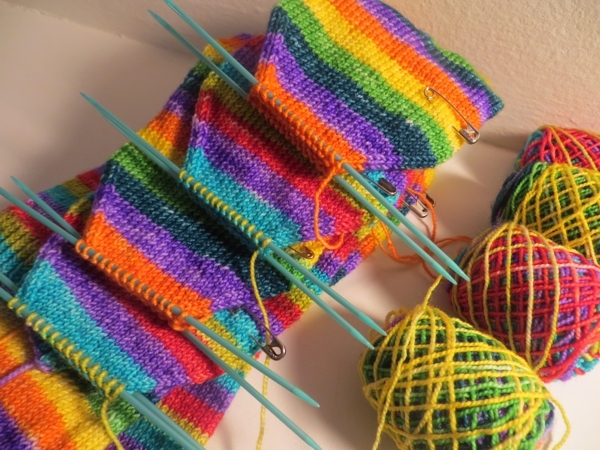 That is some gorgeousness in sock form! I knitted on my Fire and Ice socks while on my trip...finished the Across the Universe. All very happy knitting! I would kill for a day like that - the earliest I might expect one though will be close to new years! I won't tell you all the things I had to push off my plate to make it happen ;^) But it was so worth it! ohhh Leslie, nice sounding socks!